This 3/32" Collet allows the Dremel Brand sander to accommodate the 3/32" shank diameter (size) for almost all of the burrs, disks, barrels that we use. Necessary part if you want to use the sanding disks on your Dremel Drill. plus 1 - Collet for all 3/32nd burrs, disks, etc. 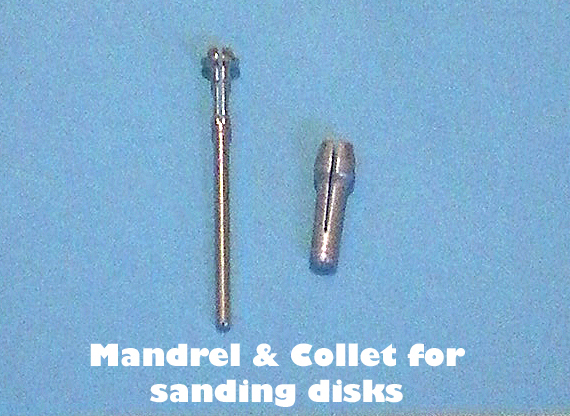 1 - 3/32" Collet - needed for Dremel Brand Sander because all burrs, disks, etc are 3/32"
and the Dremel does not come with the proper collet adapter. The video below will show you how to install the collet and mandrel pieces onto your Dremel drill so that you can use the sanding discs.